Wera Kraftform VDE Kompakt Interchangeable Screwdriver Set comprises of a VDE handle with blade auto-lock system and VDE blades. Individually tested under a 10,000V load, to guarantee safe working at 1,000V. Supplied in a rugged belt pouch. Drop tested at extreme temperatures to ensure insulation won't fail in tough jobsite conditions. Individually tested for dielectric strength under a 10,000V load, to guarantee safe working at 1,000V. Drop tested at extreme temperatures to ensure insulation won't fail in tough jobsite conditions. 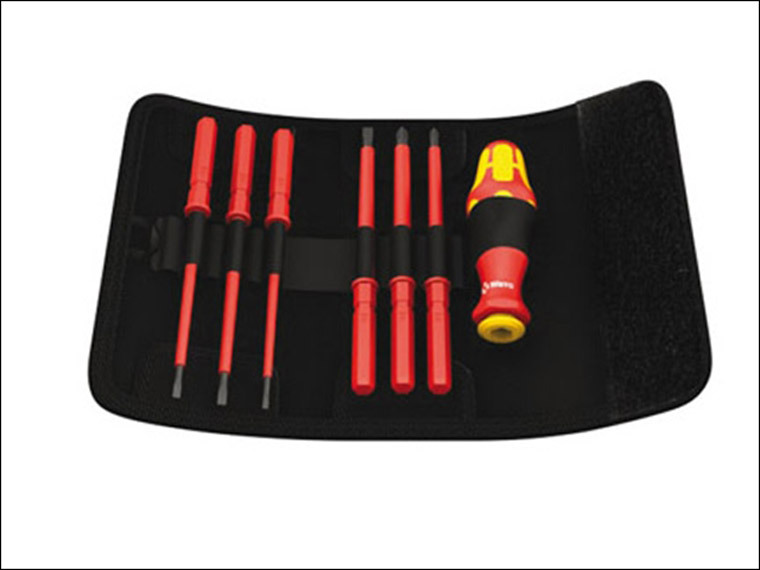 The screwdriver tip is made from powerbit grade steel for unbeatable strength. 4 x Slotted screwdriver Blades 2.5, 3.5, 4.0 and 5.5mm. 2 x Phillips Blades PH1 and PH2.